Kitchens are dangerous places. Injuries are costly, but preventable. The restaurant industry in America has a troubling safety record. With more than 1 million restaurants across the country, and more than 14 million employees, it’s not surprising that kitchen accidents inevitably happen. When you better understand common dangers in your restaurant back-of-house (BOH), you can work to have a positive impact on the overall safety of your restaurant and better manage the costs and profitability of your business. The National Safety Council estimates that more than 25,000 slip-and-fall accidents occur every day in the United States2, so it’s important that restaurants take a proactive role in preventing them. Only 2 percent of restaurant industry injuries are severe, with claims of $100,000 or more3. Severe injuries account for 41 percent of every dollar spent on workers’ compensation losses4. You would need to sell 3,000 QSR meals (quick service restaurants) or 1,300 casual-dining meals to cover the cost of the average workers’ compensation claim7. Maximum penalties increased by 78%. Accident statistics typically reflect reportable injuries and are based on a medical bill that’s been paid. But for every accident that requires medical treatment, there are an equal number of employees who don’t seek medical care with minor burns, cuts, bruises or strains. Even so, these mild injuries can hurt the restaurant’s bottom line in terms of lost time and revenue. Training employees to follow proper restaurant safety protocol hinges on your leadership skills. It’s important to make safety an integral part of an organization’s core business objectives. That means talking to employees about safety in the same way you discuss labor, food costs, turnover and equipment. Provide proper training to reinforce restaurant kitchen safety compliance. Get a more in-depth look at safety and training for your restaurant, plus our “Menu for Prevention” checklist. Lifting 35-pound oil jugs can lead to strains. 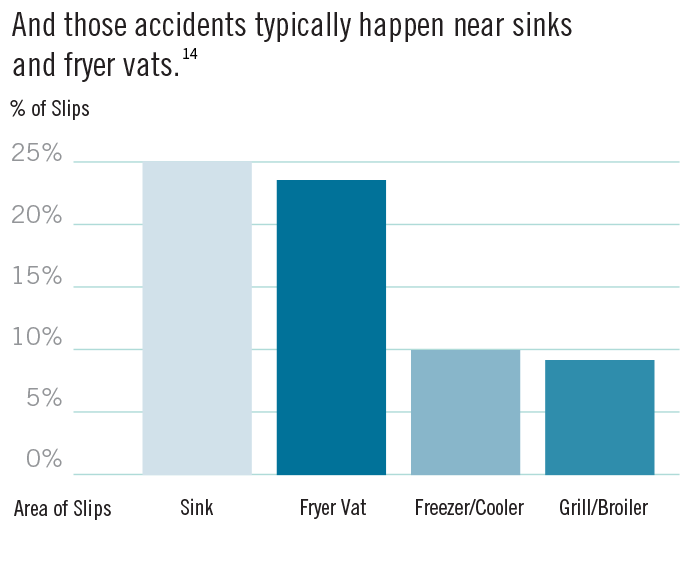 Pouring oil into fryers increases the risks of burns, slips and falls (especially if any oil spills onto the floor). Disposing of hot, used oil can be a messy, dangerous job. Transporting hot oil for disposal can result in accidents, particularly if performed incorrectly. Pouring oil into rendering tanks is an unpleasant task. You can have a safer, smarter kitchen. While the restaurant industry in America has a troubling safety record, we can and do take pride in providing products that increases restaurant’s and kitchen’s compliance with the Americans with Disabilities Act (ADA). You can make your kitchens safer for your employees. You can reduce the risk of accidents, and at the same time, boost the profitability of your business. And Restaurant Technologies can help. With your kitchen operating at full force, grease is sure to build up in your hoods, flues and fans as a byproduct of cooking. Keeping your kitchen clean is the only way to reduce the risk of fire, ensuring a safe and efficient operation. Traditional hood and flue cleaners send in a cleaning crew on a quarterly or semi-annual basis. They shut down your kitchen to scrape or wash away grease with harsh chemicals, often leaving behind a mess or damaged equipment. The AutoMist system from Restaurant Technologies eliminates the need for these costly, messy cleanups by automating the entire process for a worry-free experience. AutoMist cleans your hood, flue and fan every day with a powerful spray mixture of detergent and water to prevent hazardous grease buildup. The AutoMist system minimizes fire risk in your restaurant every day by keeping the hood, flue, and fan area clean. With daily cleanings, grease is no longer accumulating over time. This keeps your restaurant – and everyone in it – safe. 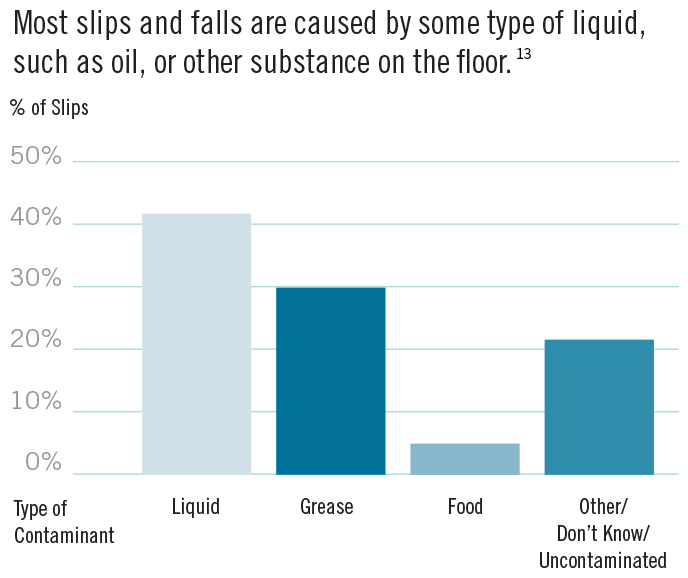 Cooking oil handling and spills are at the root of restaurant employee accidents such as slips and falls, strain injuries and burns. But you can take action to reduce these risks in your kitchen. 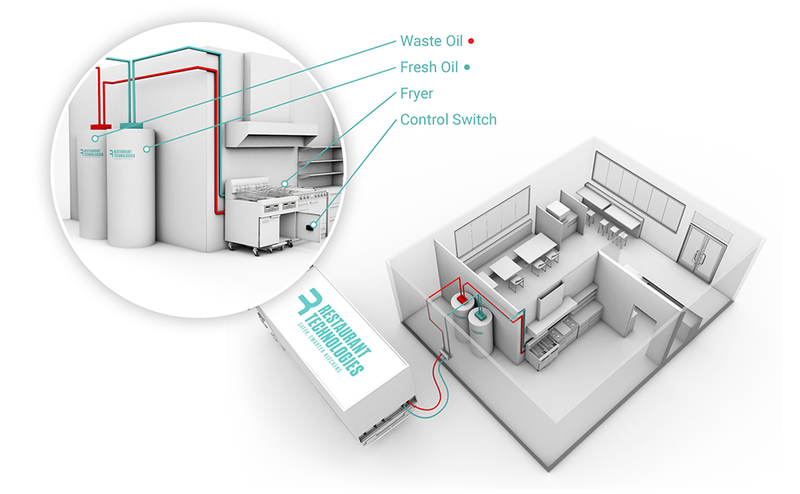 Restaurant Technologies' closed-loop oil management system allows employees to safely and easily dispose of used oil and fill the fryer with new oil with the flip of a switch. No need to ever carry hot oil again. By creating a safer way to manage a risky and frustrating task, employees feel more engaged and satisfied with their jobs. By eliminating one of the most dangerous restaurant kitchen tasks, employees are no longer at risk for oil-related injuries like slips, falls, and burns. Overall dramatic reduction in risk while increasing customer and patron safety. An automated oil management solution improves physical security by eliminating the need for employees to travel back and forth to the area of the rendering tank to dispose of oil packaging and waste oil. Often, this practice adds unnecessary risk and leaves the back entrance unsecured as employees haul oil containers and oil to the bins. From an employer's perspective, fewer injuries and security risks translate to better peace of mind that employees are not hurt or victimized, fewer sick days, fewer Workers' Compensation claims, a better overall work environment and improved retention of employees. Marsh & McLennan Companies, Workers’ Compensation Best Practices Report, August 2015. Slip and Fall Facts, http://www.lighthouseenterprises.us/Hurricone/Slip%20n%20Fall.pdf (accessed August 5, 2016). 4 National Restaurant Association, News & Research, “Facts at a Glance,” http://www.restaurant.org/News-Research/Research/Facts-at-a-Glance (accessed August 5, 2016). 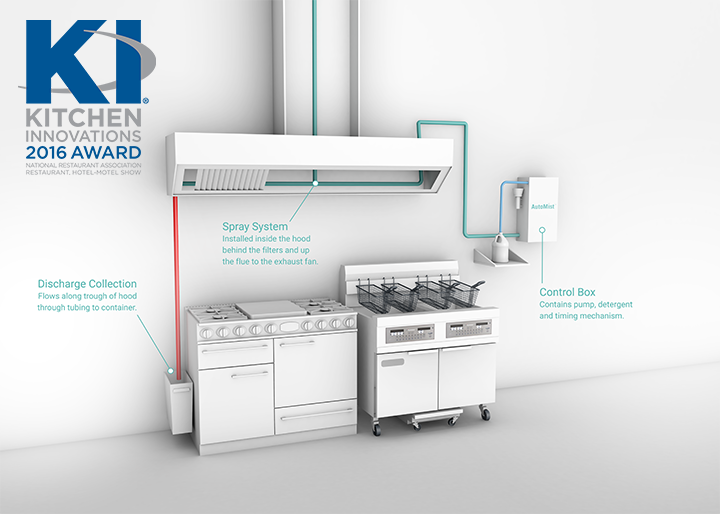 “Making [Brand’s] Kitchens Safer,” Restaurant Technologies. National Council on Compensation Insurance. National Safety Council, “Prescription Pain Medications: A Fatal Cure for Injured Workers,” 2015, http://www.nsc.org/RxDrugOverdoseDocuments/Rx-Fatal-Cure-For-Injured-Workers.pdf (accessed August 5, 2016). SFM Mutual Insurance Co., “How prescription drug addiction can impact a workers’ compensation claim,” 2016, Simply Work Comp, https://simplyworkcomp.com/how-prescription-drug-addiction-can-impact-a-workers-compensation-claim/ (accessed August 5, 2016). “Top Four Restaurant Injuries,” QSR Magazine, September 19, 2011, https://www.qsrmagazine.com/news/top-four-restaurant-injuries (accessed August 5, 2016). S.K. Verma, W.R. Chang, T.K. Courtney, D.A. Lombardi, Y.H Huang, M.J. Brennan, M.A. Mittleman, J.H. Ware and M.J. Perry, “Worker’s Experience of Slipping in U.S. Limited-Service Restaurants,” Liberty Mutual, May 19, 2010.